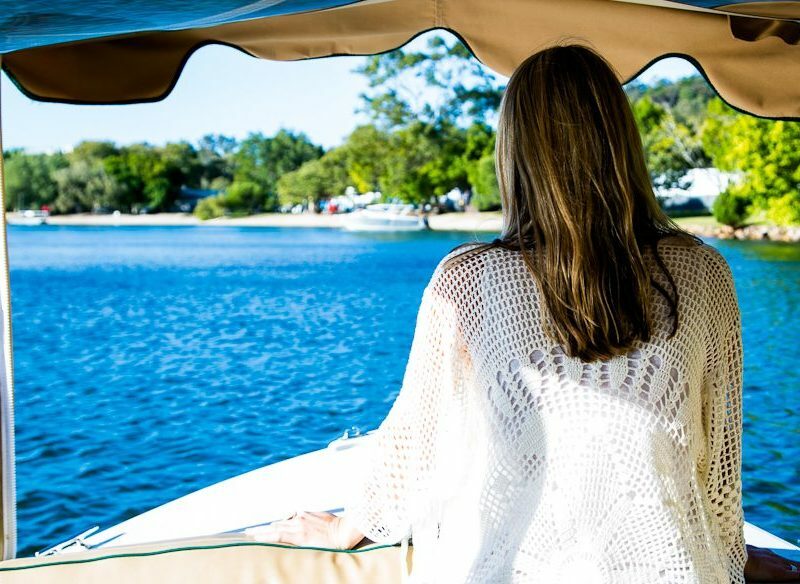 Afternoon on the Noosa River (BYO) with Malu Os. So Noosa – Noosa Cold Press juice. Cold-pressed juices: so Noosa. But we’re not complaining about the new Noosa Cleanse bottles lining the fridge shelves in Belmondos and Café Le Monde. With green blends, ‘spicy lemonaid’ laced with cayenne pepper, and anti-inflammatory elixirs through to chai cashew milks, the white-lidded jars have become the drink du jour amongst Noosa’s densely populated health-conscious crowd. Start the day with one and pack another in your beach bag. You know those book stores that have unique greeting cards and gift ideas that almost outshine the new tomes on the shelves? Well, River Read is one of those. While one wall shows off new releases and shiny celebrity chef cookbooks, the rest of this cute little reading nook is dedicated to second-hand books, stamps, craft and calligraphy supplies, beautiful wrapping paper and cards, and to top it all off, coffee and cakes with a cosy little outside courtyard. Kick back on a Frida Kahlo cushion with an iced mocha as you flip through Humans of New York. Got money to bet on the best thing to do in Noosa? Put it on two hours on a little electric boat called Lady Ann. And as we step aboard our almost gondola-esque (but higher on the comfort and luxe factors) electric boat on the Noosa River, she’s right behind us with a ‘corcksicle’ ice stick to keep the vino cold. “I couldn’t get a good haircut anywhere growing up and I was over it,” Malakai Mitchell tells me as he deftly snips, shapes and shaves a client’s hair in his retro red leather barber’s chair. Captain Sip Sop’s is part hipster barber, part ’70s surf shop housed in a nondescript shed in Noosaville. Mitchell, alongside surfboard shaper Thomas Bexon, set up shop a few years ago. With a chilled-out vibe, a skate ramp out back and clothing racks full of Deus ex Machina threads, Herschel knapsacks and Uppercut Deluxe grooming products, this is where it’s at if you want to shake up the usual ‘short back and sides’, and grab a new pair of boardshorts. There’s usually a wait-list for a Saturday appointment. The everything is good at Belmondos Noosa. The hottest thing in Noosa right now is nowhere near the beach. Set your GPS for the Noosaville industrial park and step into the designer warehouse known as Belmondos to trip the light organic. Slowly replacing 15,000 products on their shelves with natural and organic products, the one-stop foodie destination now consists of different ‘market stalls’. You’ll find excellent coffee at Clandestino Roasters, 22-hour fermented sourdough from Tanglewood Bakery, and a healthy organic deli full of sandwiches, salads, quiches and other goodies. Stock your holiday apartment’s kitchen or just pop in for a coffee. Nitrogenie attracts a curious bunch of spectators watching the girls behind the counter whip up magical cauldrons of liquid-nitrogen-powered soft serve à la Heston Blumenthal. With a long menu of flavours like Salty Caramelley Popcorn and Turkish Fairy Floss, you’ll want to pace yourself. This is basically the antithesis to the green juices from Noosa Cleanse – though we’d argue it’s worth it. You’ll find something suitably floaty and a little bit boho at JOJO on the roundabout, and a fresh-from-the-beach look from Bow & Arrow. Alterior Motif at the Noosa Woods end of Hastings Street (photo: Elizabeth Allnutt). But if your style is less about emulating a colourful, bedazzled lorikeet and more, say, magpie-minimal, head straight to Alterior Motif toward the Noosa Woods end of Hastings Street. A chic curation of cool and casual fashion with a few homewares thrown in, you could spend hours sheltering from the midday sun here. However, there are other shops worth your time, such as the iconic Noosa Longboards where you can pick up all manner of surfing related items, as well as a board to hire and a lesson to make the most of it. And for taking that Noosa feeling home, indulge in a little self-gifting from Signature on Hastings, a collection of homewares ranging from very-Noosa neutrals to riotous Missoni towels. Seahaven occupies a hefty slice of beachfront real estate and has that fresh new-house feel, having undergone a major renovation in 2013. Everything is shiny and new in these serviced apartments – the plush lounges look as if they haven’t been sat in yet. The master bedroom is concealed by modern frosted-glass sliding doors and a partition looking into the living area means you can check the surf from your bed! Wi-fi is free, the bathroom houses a bath amply big enough for two and the Appelles certified organic skin care products are divine. But the best part is being able to stroll across your ‘front yard’ onto the beachfront path. Signaturary on Hastings sounds interesting . We were up at Noosa in Feb for a week. Sure Hastings St is popular but we found gems down along the river in Noosaville for fashion. Amazimgly affordable too. Venture out abit..even Peregian Beach we improved the economy! ! Cooroys Little Empotium, Fashion,Home, Lifestyle Gifts. Cooroys Botanical Gardens, Cooroy Shoes an Icon. We’re on it. Thanks for the suggestions.